Questions appear each week on the Quiz section of the Graduate website.You just have to search to find the correct answers. After each question there is a link through to the web page containing the correct answer. All questions must be answered by following the links to sponsors’ websites. When you have answered all the questions press the submit button. If any answers are incorrect you will have the opportunity to go back and try again. There will be at least 1 prize winner announced each week for one of the Trips to the European Parliament in Strasbourg. 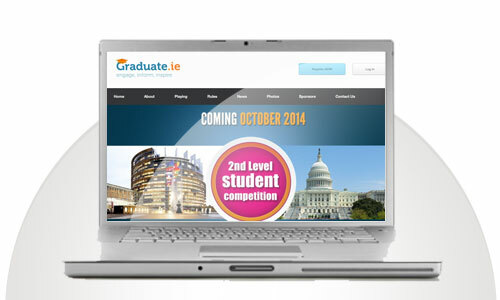 You must be a second level student with a home address in the Republic of Ireland to take part. Second level students will be validated via their school. There is absolutely no charge to take part in the quiz – prizes are funded by sponsors who wish to reach students with their civic message. Prize winners will be by randomly selected by computer from all who have submitted the correct answers. All information submitted when you are registering to join the quiz will be kept completely confidential and will not be made available to outside bodies. New members can join at any time throughout the year. This Graduate.ie program is funded by Local and National Government Agencies and The European Parliament.